Note: This review of WING AND A PRAYER is my contribution to today's Dana Andrews Blogathon, being sponsored by Stephen at Classic Movie Man. Be sure to check out all the other great blogathon posts celebrating this very special actor. WING AND A PRAYER, subtitled THE STORY OF CARRIER X, is a well-made World War II film from 20th Century-Fox, directed by Henry Hathaway. The film, which is set in the months between Pearl Harbor and the Battle of Midway, tells the story of a carrier on a mission to trick the Japanese into thinking the United States fleet is scattered and unwilling to fight. Ultimately the Japanese Navy will head to Midway, where the United States will win a great victory. 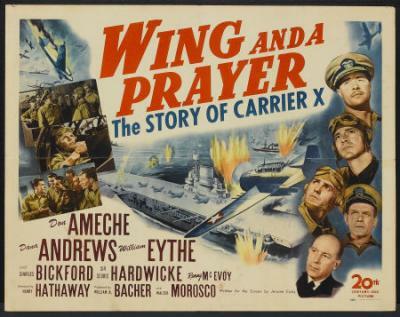 Don Ameche gives a strong, uncharacteristically tough performance as the stern flight commander aboard the carrier, who must continually make decisions which will lead to the loss of his men in combat. Dana Andrews plays a pilot who heads a flight squadron, with Charles Bickford playing the captain of the carrier. Various crew members are played by a large, interesting cast including William Eythe, Reed Hadley, Glenn Langan, Richard Jaeckel, and Harry Morgan. The bit players among the crew members include Ray Teal, Blake Edwards, Jimmie Dodd, Irving Bacon, and Arthur Space. Little information is given about the personal lives of any of the men, save for the sketchiest details: one is a Hollywood actor, one is just 16, one has an idea to grow vegetables on board ship. For the most part the film is strictly focused on the operations of an aircraft carrier. As Lt. Commander Moulton, Andrews' character must straddle a line between being an authority figure, responsible for leading his men and answering to his superiors, along with being one of the "gang," sharing camaraderie with his fellow pilots. When one of his men (Harry Morgan) is frustrated and disobeys orders from the flight commander, Moulton is forced to ground the pilot, though he clearly sympathizes with him and later seeks him out to socialize. Despite having virtually no back story, Andrews is highly effective as a serious, confident pilot who grapples with tough situations on a daily basis, and the rest of the cast is likewise excellent. It's an engrossing film which is a solid contribution to the catalogue of war movies made by Hollywood in the early '40s. Over the course of WWII, Andrews appeared in a variety of war films, including the title role in the "B" film BERLIN CORRESPONDENT (1941) and playing a Russian in THE NORTH STAR (1943). Andrews played members of the military in CRASH DIVE (1943), THE PURPLE HEART (1944), and A WALK IN THE SUN (1945), and he famously played a WWII veteran newly returned from service in William Wyler's classic THE BEST YEARS OF OUR LIVES (1946). Additionally, in the early '50s Andrews appeared in another film set during WWII, THE FROGMEN (1951), and then played a WWII veteran considering signing up to serve in the Korean conflict in I WANT YOU (1951). The story and screenplay of WING AND A PRAYER were by Jerome Cady. The film runs 97 minutes. It was filmed in black and white by Glen MacWilliams. WING AND A PRAYER is available on DVD in the Fox War Classics series. The DVD can be rented from Netflix, and it's currently also available via Netflix streaming. It was also released on VHS, and it's shown periodically on Fox Movie Channel. 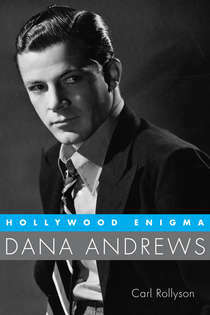 Admirers of Dana Andrews will be glad to know there is a brand-new biography, DANA ANDREWS: HOLLYWOOD ENIGMA, written by Carl Rollyson. Originally due out this fall, it's now available for purchase. The book is from University Press of Mississippi, which has a track record of publishing excellent biographies of Hollywood actors. I'm looking forward to ordering it soon. Dear Laura, better late than never. So glad you toughed it out and got this in. It's a wonderful addition to the blogathon. I like how you pointed out that Dana creates a character without much backstory. Even so, we care for his welfare as well as the welfare for the other men aboard the carrier. Now if only Deanna and Dana made a picture together. Do you think Dana would have sung a few bars? :)Thanks again for participating! 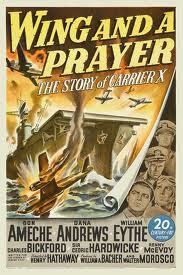 Dana Andrews rated his performance in Wing and a Prayer as one of his best. So I took a really close look at it in my biography of him. It is very much in line with his work in The Purple Heart, in which he portrays a sensitive and strong leader. Virginia Zanuck watched Dana act on the set of Wing and a Prayer and put in a good word for Dana to her husband, Darryl, who did not initially want Dana for Mark McPherson in Laura. She saw Dana's leading man potential, although she was a little surprised. She told Dana that she had always thought of him as a "second lead"--not the guy who gets the girl. Dana pointed out to her that of course when he was assigned second leads, he played them that way. It was not his job to outshine the star. You would think Hollywood pros would understand that, but they, too, could not see beyond typecasting, which is one reason why Dana did not want to sing in pictures. He did not want to be typecast as a singing actor, a Nelson Eddy. William Eythe, by the way, played the young man in THE OXBOW INCIDENT who refuses to participate in the lynching. 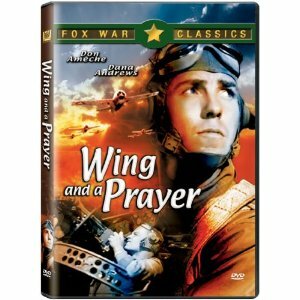 In Wing and a Prayer he played the role that Fox wanted Tyrone Power to play, but Power had enlisted and was not available. I keep forgetting to recommend WING AND A PRAYER. I think it is extremely well done. I like the scenes with Harry Morgan playing the loud mouth and Dana handling him in such a shrewd way. The two men were good friends off screen until there was a rupture, the full details of which I'm still trying to sort out. Done Ameche, by the way, was a great admirer of Dana's acting. Thanks for bearing with me while I got my new computer set up, I'm glad I was still able to to participate! And it was a great excuse to see a very enjoyable film. I agree, Dana and Deanna would have been an excellent screen team! Kristina, love knowing this was an early addition to your collection. It's excellent, as is SO PROUDLY WE HAIL which I'm so glad you made possible for me to see! The cast is terrific -- it's so much fun watching all the faces in a movie like this. Dana was upset when he learned Gregory Peck got the plum role in Twelve O'Clock High. Dana thought the role should have been his. Dana also wanted to do Gentleman's Agreement. So let's say Peck was never a favorite of Dana's! Congratulations on your new computer. I'm glad you were able to share your post with us in this interesting blogathon. Thanks for another great perspective on Dana's work. It is so nice to see more appreciation of Dana Andrews these days. I've never seen him do a bad performance. From the nose down, he actually resembles my husband! I got to meet Dana Andrews briefly in around '76. He was extremely nice and friendly, talked a little about his musical training and how he'd insisted on not being typecast as a singer, which was new information for me at the time. He and his wife were rehearsing a dinner theatre show at the same theatre in which I was wrapping up a run. There was another major movie buff in my cast, and the two of us were so dazzled at meeting Dana Andrews that we stayed in the greenroom after the show till about 4 a.m., making a list of his movies, all that we could remember, on the back of an envelope. Finally, figuring we'd gone as far as we could we dropped the envelope on a table and dragged ourselves off to sleep. The next day when we arrived for our performance, the stage manager pointed to the envelope still sitting on the table and said, "that's for you." Four or five titles had been added to the list and at the bottom was written, "I think that's all. Thanks for remembering, Dana Andrews." It was pretty dazzling. Unfortunately, because the other guy had contributed a few more titles to the filmography than I had, he unilaterally decided that the envelope was his. Still, it was pretty memorable and left me feeling more fondly than ever of Mr. Andrews. Carl Rollyson: I really do like Peck in 12 O'Clock High, but on consideration, I think Andrews would have been even better. He could convey a sense of fatalism and suppressed anguish so well. I suspect those who think Andrews was wooden aren't looking close enough.) Though it is hard to imagine 12 O'Clock High much better than it already is because of the great ensemble cast. One of those interesting might have beens. Did his drinking problem contribute to the fact that he did not win the role? Wow, that sounds just like Dana Andrews, Rick. I really appreciate your taking the time to share this memory of a wonderful man and actor. Thanks to you all for such an interesting discussion! I love the thought of Dana Andrews being in TWELVE O'CLOCK HIGH. CrochetedLace makes a great point at how well Dana does portraying suppressed anguish. Carl, I'm always happy to see Harry Morgan in a movie and it's shame that something happened to his friendship with Dana. I really appreciate you taking the time to help flesh out the background of this film with your research. It's a great preview of your book, which I'm looking forward to reading. Rick, that anecdote is simply beyond great. I enjoyed it so much I read it twice. :) Thank you so much for sharing it!! Thanks for the congrats and your comment, Jacqueline! It's always a good/bad thing to get a new computer -- most of my weekend has been spent transfering files and trying to configure it to my liking. Now that I'm almost all done with computer work, I'm looking forward to catching up on the other Andrews posts I haven't been able to read yet, such as the one you wrote on Dana Andrews in SWAMP WATER. Laura, I can't say for sure that Dana's drinking might have contributed to his not getting the Twelve O'Clock High role, but it might have been a factor. Henry Fonda told Dana's wife Mary that Fonda got some roles otherwise destined for Dana because of Dana's drinking.